Together form a complete, omni-channel, WFO and analytics-rich portfolio. Smarter and faster was the theme of last week's user/partner/analyst conference by NICE and inContact, held just six months after completion of NICE's purchase of inContact in the fourth quarter of 2016. CEO Barak Eilam told the assembled audience of 2,200 that NICE advanced analytics and automation solutions are at the heart of the company's portfolio offerings that will allow its customers to re-invent customer service. The faster theme was primarily about the faster deployment and realization of business value that comes with migration to the cloud. For me, "faster" was also how I felt about the announcement that a combined offering of inContact's contact center solutions and NICE's WFO, built using and deployed on AWS, is scheduled to be available in August 2017. For several months, the inContact and NICE sales people and channel partners have been able to offer NICE's AWS-based Evolve WFM with inContact's contact center. The enhancements expected this summer will mean a single administrative tool for contact center and not just WFM, but also a new Evolve Quality Management (QM) solution as well. Omri Hayner, NICE's general manager, Enterprise Workforce Optimization, told the analysts that Evolve QM was developed from the ground up as part of the Evolve suite. Evolve QM sits on the same platform and infrastructure and was built using the same design principles as Evolve WFM. Elements of Nexidia analytics are also being woven into the new combined solution. Analysts were told to expect an Evolve Analytics portfolio element in first quarter 2018. Finally, work is also underway to bring the user interface and experience of the heritage inContact and heritage NICE components into alignment. From my view of the prototype screens its seems the final design borrows most heavily from the frog design-influenced inContact agent desktop, My Agent eXperience (MAX). Given how quickly this joint offer is coming together, it was not surprising to learn that 250 programmers have been dedicated to the effort to bring the company's combined portfolio to AWS. Summarizing the progress to date, inContact CEO Paul Jarman commented via email, "We're excited to combine leading technology from NICE and Nexidia to create the most complete, advanced, and easy-to-use cloud contact center solution available. Our summer 2017 inContact release will provide a fully unified user experience and microservices cloud architecture that combines omni-channel routing, workforce optimization, and analytics -- all delivered on an enterprise-grade cloud platform. This truly unified cloud contact center suite will make it smarter and easier for agents and contact center leaders to deliver great service." 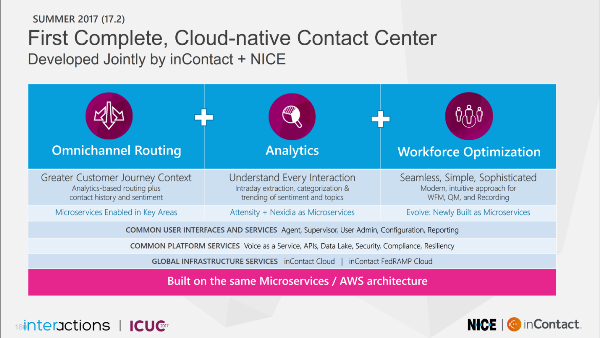 While there is certainly reason for the cloud contact center incumbents to take the threat of Amazon Connect seriously, Amazon's ability to compete with the kind of complete, omni-channel, WFO and analytics-rich portfolio NICE and inContact are putting together is at best years away.